Cool, got Jacks Ip and I will attempt to connect at 1 min past the hour. Also, no comms for me. What does that even mean, Wang? It has been suggested that we might want to test the audio on Discord while in game to see how everyone sounds during actual game play. I think it's a great idea and as we all know I've been having mic issues, and I think my button might need a little help, or maybe I need to change ptt buttons. It's a good way to be more sure you're being heard when you're talking in game. There was some talk after the last mission about near friendly kills, etc ( the usual) due to confusion about who's in on a target. Of course there's going to be some of that no matter how good we are about it. But if there's some setting I can change on the voice server that'll help, or if some one's button is a little intermittent, I think recording during the actual game play might provide a clue. This way we can make sure when you're calling a target , you're being heard. It's a way to start looking for a way to reduce the chances of a friendly kill at least. I'm thinking that maybe while in game, for whatever reason, flaky push to talk buttons, maybe voice audio level changing when the game launches, audio delays when the game is running, maybe just being too quick on and off the ptt button because it's a combat situation, who knows, But if there's something we can do to minimize that kind of thing from happening I'm thinking getting a recording so I , or you, can listen to it and see what's actually coming through on comms during an actual combat mission would be a good place to start looking for ways to make that situation better and reduce the chances of a friendly kill. So what I want to do is record what comms sounds like during the next mission by saving an audio file of it, then later I'll listen to see if I can't find something I could fix with settings on comms. I've found a good way to record, it doesn't affect bandwidth because it uploads the audio file for download after the mission's over. I'll also send it to, or make it available for anyone else that wants to listen to it. Any thoughts? Objections? Suggestions? Let me know. thanks. O yea, If we decide to try recording, we'll want to make sure everyone on comms knows recording is active. Not knowing you're being recorded is not cool, and we wouldn't want to endanger any one's decision to run for political office in the future. Thanks for reading. P.S. I'm also hoping a few nuggets of comedy gold might be found in there, too. "What the hell, let's see what happens"? Me too. That sounds like a great idea. I will try to pronounce ruddah correctly. Great turn-out for mission - 16, we had 18 pilots altogether !!! Here is the next briefing to be flown on Tuesday - January 15th. Well Done ... covering the fleet and sea-borne landing during the invasion. The group shot down over 40 enemy aircraft in the air, many of which were the enemy's new terror weapon, the "Kamikaze". The group is moving to the airfield on Mindoro for the next operation. The group will be flying the P-38 Lighting and the A-20 Havoc. Good Morning Gentlemen ... Welcome to Mindoro. 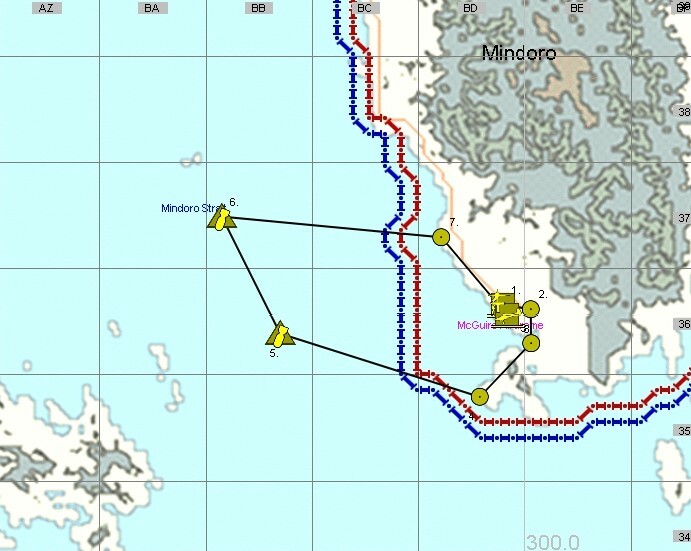 The Army has found very light resistance here on Mindoro and has already secured just over 1/2 of the island. 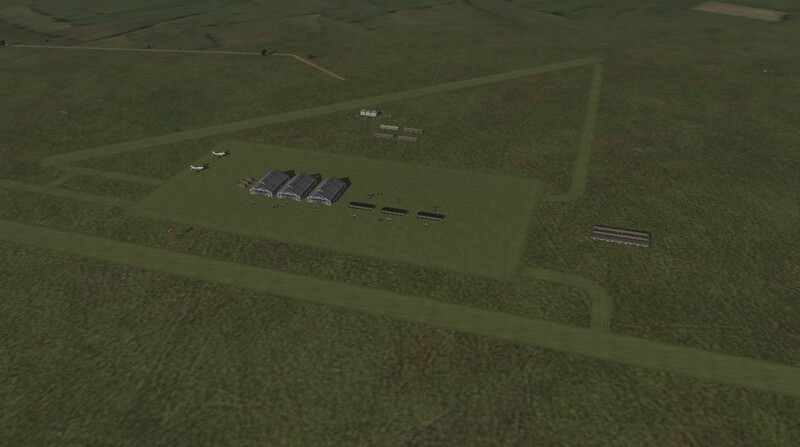 The Sea-Bee's have secured this airfield and have made numerous repairs. They have also secured a partially completed airstrip on the north side of the island in grid BE-41, pad 4. That airfield will be ready in about 2 weeks. 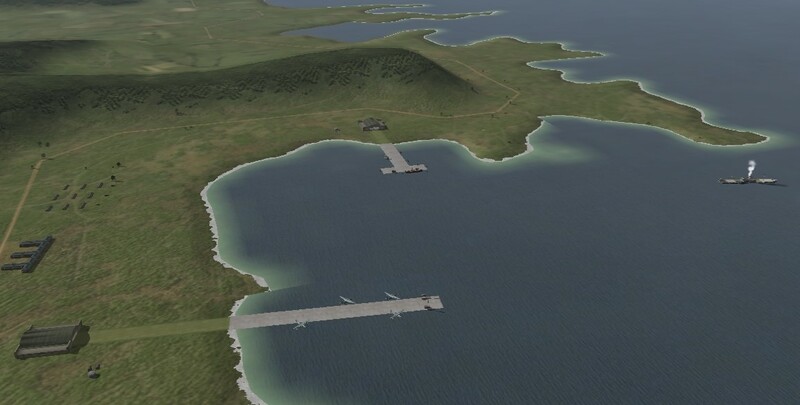 Our task for today is to hit the enemy's communication facilities and Kindley Airfield on island of Corregidor, grid BB-46, pad 2, as well as, the nearby sea-plane base just to the south, grid BB-45, pad 6. 1st Squad (P-38) - arm with default. Provide CAP for the strike aircraft. 2nd Squad (A-20) - arm with bombs. 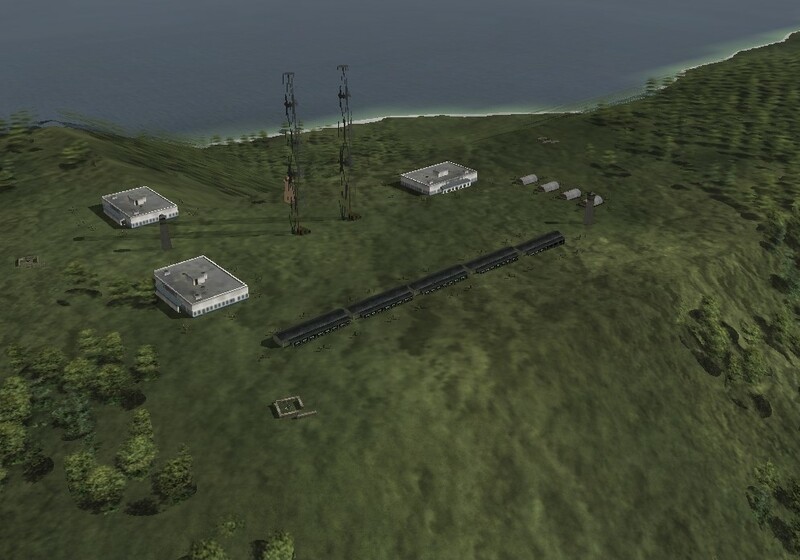 Strike the communications facilities and Kindley Airfield on Corregidor, grid BB-46, pad 2. 3rd Squad (A-20) - arm with bombs. 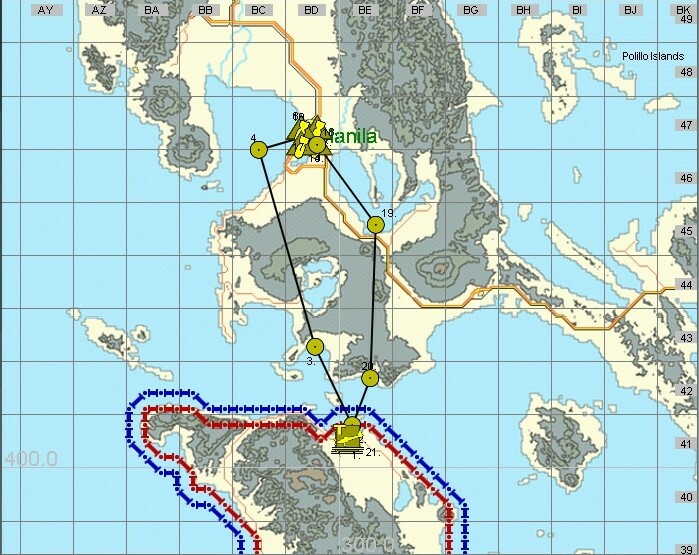 Strike the sea-plane base in grid BB-45, pad 6. HQ & Guests (P-38) - arm with default. Provide CAP for the strike aircraft. * All pilots to use same comms. * All aircraft are at ZERO fuel. Re your comms ideas, sounds good BB. I think one area where we are kinda handicapped is Discord's 200% limit when you are manipulating other people's volumes on your end. In Vent you could go up to like 500, 600 percent or more. You could crank someone up as much as you needed. I'm finding 200% is not enough in some cases. I agree, DW. Seems if some one has to be turned up more than double, something is wrong on their end.. in this case I mean my end. i'm hoping I've improved it to where I can be consistently heard again. Sound on computers has always been the most frustrating thing to troubleshoot for me, and they seem to keep making it more and more troublesome. It's treated like it's the red headed step child of PC tech. I know I'm breaking the rules big time by saying this but that's just the kind of person I am. Yea.. we secretly do, Arch. Great turn-out for mission - 17, we had 18 pilots altogether !!! Here is the next briefing to be flown on Tuesday - January 22nd. Well Done ... hitting the communications facility on Corregidor and the enemy's sea-plane base. Both are out of action. The group also destroyed over 15 enemy aircraft in the air. 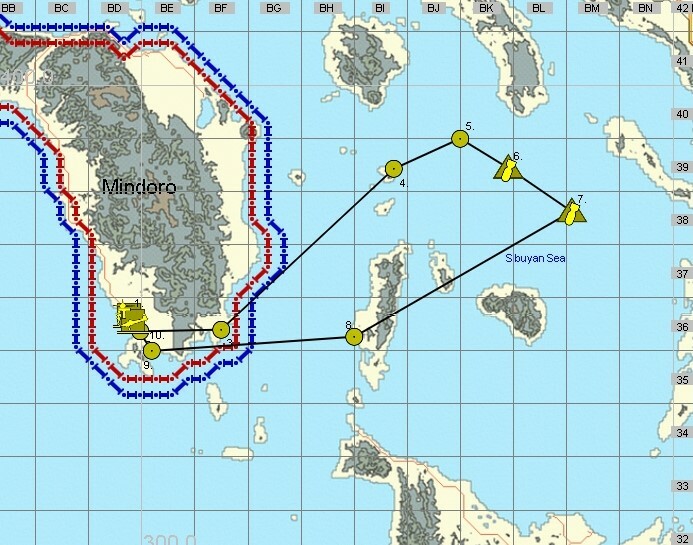 Mindoro is now secure, the Army has control of the island. Coast-watchers have reported an enemy naval convoy heading for the Subuyan Sea. It appears that the enemy is pulling their troops out of Samar to reinforce Luzon. The last known position of the convoy was in grid BN-37, on a heading of 310 degrees, speed 20 knots. The convoy looks to be made up with a cruiser, 4 Maru transports, and a destroyer. 1st Squad (A-20) - arm with torpedoes. Attack the enemy naval convoy. Start the search in grid BL-39, pad 1, area to grid BN-37, pad 7. 2nd Squad (P-38) - arm with default. Provide CAP for the strike aircraft. 3rd Squad (P-38) - arm with default. Provide CAP for the strike aircraft. * All aircraft are ZERO fuel. Excellent turn-out for mission - 18, we had 20 pilots altogether !!! Here is the next briefing to be flown on Tuesday - January 29th. Well Done ... hitting the enemy naval supply convoy. The group sank all the enemy transports. The group also shot down more than 12 enemy aircraft in the air. *ATTENTION ... Coast-watchers have reported during the night/early morning hours enemy warships have been seen heading for our position here on Mindoro. The last known position of the convoy was in grid BB-37, on a heading of 170 degrees, speed 20 knots. The convoy looks to be made up with 2 cruisers and 4 destroyers. We're going to hit the warships. A-20's - will attack the cruisers. P-38's - will attack the destroyers. 1st Squad (A-20) - arm with torpedoes. Attack the enemy cruisers (x2). Start the search in grid BC-36, pad 1, area to grid BB-37, pad 3, flying a north-west heading of 340 degrees. 2nd Squad (P-38) - arm with bombs. Attack the enemy destroyers (x2). Start the search in grid BC-36, pad 1, area to grid BB-37, pad 3, flying a north-west heading of 340 degrees. 3rd Squad (P-38) - arm with bombs. Attack the enemy destroyers (x2). Start the search in grid BC-36, pad 1, area to grid BB-37, pad 3, flying a north-west heading of 340 degrees. Excellent turn-out for mission - 19, we had 20 pilots altogether !!! Here is the next briefing to be flown on Tuesday - February 5th. Great Job !!! ... Hitting those warships. The group sank 3 destroyers and a cruiser. The group also destroyed over 12 enemy aircraft in the air. The group is on the move once again, we are heading to Calapan airfield on the north-east end of the island. The group will be well positioned to attack Luzon from this location. Good Afternoon Gentlemen ... Welcome to Calapan airfield. 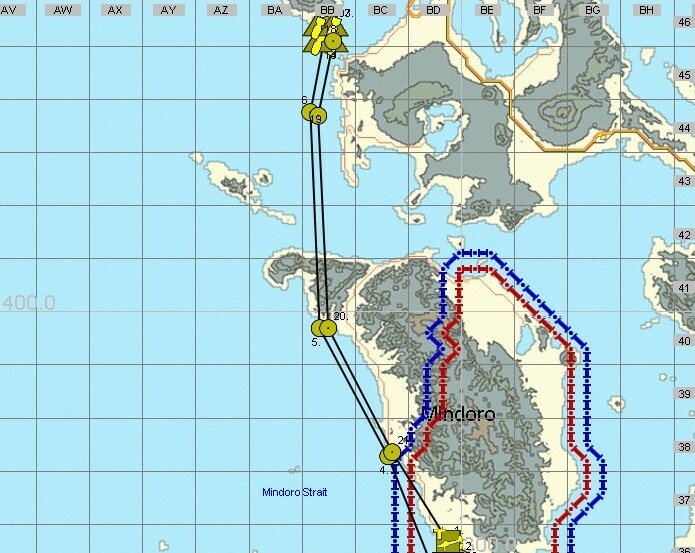 Today's tasking is hitting the port and airfield at Luzon's capital city of Manila. The port is located in grid BD-47, pad 2, the airfield is located in grid BD-46, pad 8. 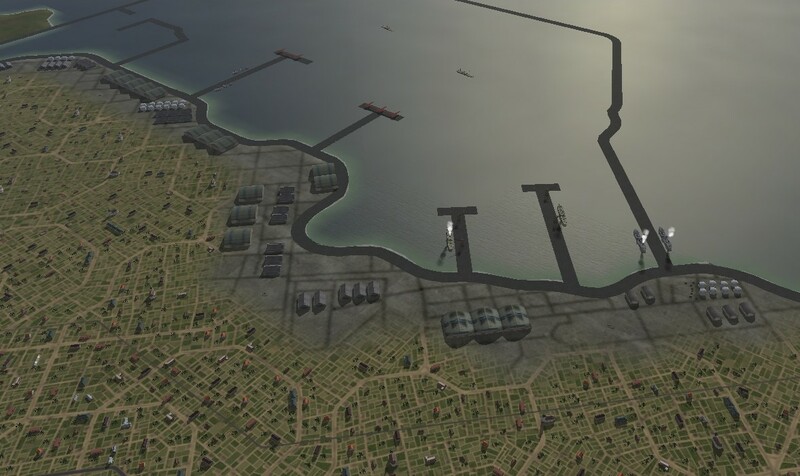 Our submarine reports noted numerous transport and fuel vessels currently in port. Filipino Guerrillas have also reported that the airfield is active with enemy fighter and bomber aircraft. Both the port and airfield are protected with AAA. It is estimated that it is at medium strength. There are regular enemy air patrols over Manila at irregular times throughout the day and evening. 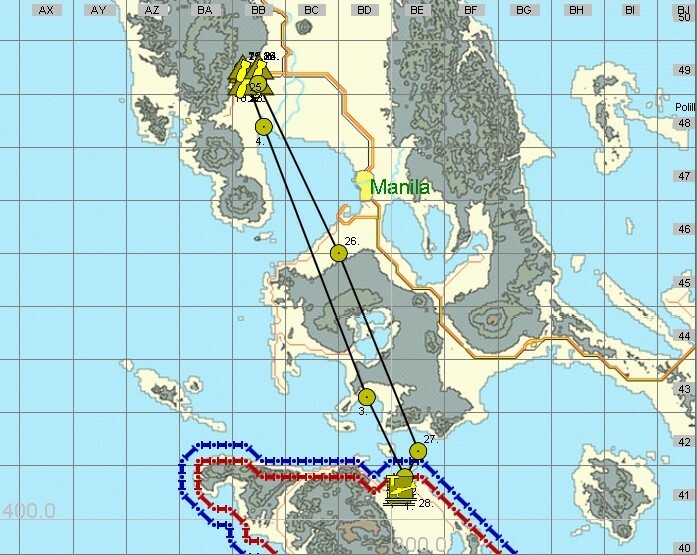 We're going to hit the enemy port and airfield at Manila. 1st Squad (P-38) - arm with bombs and rockets. Attack the enemy port, BD-47, pad 2. Target naval shipping and fuel storage tanks in the harbor. 2nd Squad (P-38) - arm with bombs and rockets. Attack the enemy airfield, BD-46, pad 8. Target enemy aircraft and facilities. We sank 3 destroyers and a cruiser? We didn't have a clean sweep? I thought we got all 4 DDs and both CLs? You guys probably did, however I've been sick since that mission, today was really the first time that I've been able to even look at my computer over this past week. So all I did was cut and paste the original mission briefing I had prepared and posted that. Excellent turn-out for mission - 20, we had 20 pilots altogether !!! Here is the next briefing to be flown on Tuesday - February 12th. Nice Job !!! ... Hitting the port and airfield at Manila. The group sank some transport and fuel ships, as well as, destroyed over 30 enemy aircraft in the air and on the ground. Upon completion of this mission, the group will be reassigned to TF-38. Good Morning Gentlemen ... Today's tasking is hitting Clark Airfield, grid BB-49, pad 4. As you know this is where the enemy hit us after Pearl Harbor, it's our turn to hit them back. There are regular enemy air patrols over the Manila area and Clark field at irregular times throughout the day and evening. AAA at Clark Field is considered medium to strong. We're going to hit Clark Field, grid BB-49, pad 4. 2nd Squad (P-38) - arm with bombs and rockets. 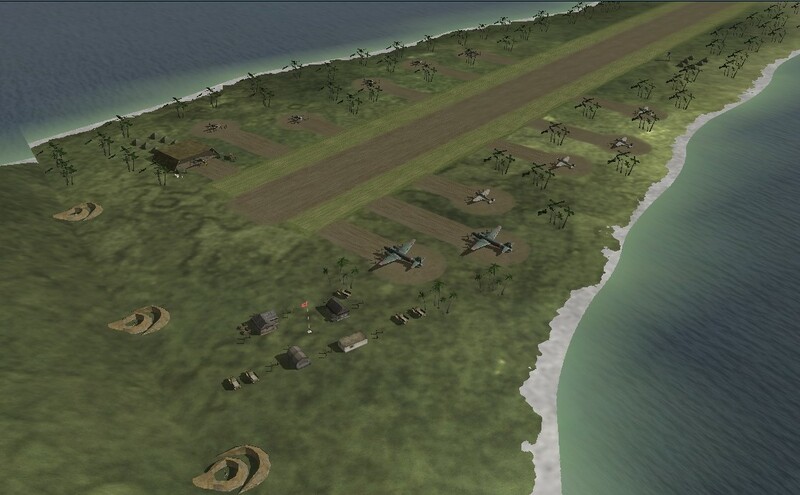 Attack the enemy airfield. Target enemy aircraft and facilities. 3rd Squad (P-38) - arm with bombs and rockets. Attack the enemy airfield. Target enemy aircraft and facilities.